THE new Rye boat ramp was officially opened on Friday with the Safety Beach Coast Guard boat being first off the ramp and into the water. The controversial extra ramp was built as part of a major upgrade, with $648,000 from Mornington Peninsula Shire and $588,000 from Transport Victoria. The mayor Cr David Gill predicted the new ramp would cut boat launching and retrieval times “from 51 minutes to 16 minutes” during the busy season. While seeing the Rye works as an “investment”, Cr Gill said an election policy announcement by the incoming Labor government should reduce the $250,000 spent on boat ramps each year by the shire. “The announcement of Labor’s Better Boating Fund has now signaled a fairer and more sustainable policy for the boating community with all funds raised from boating registration and licensing going back directly into boating and fishing,” Cr Gill said. 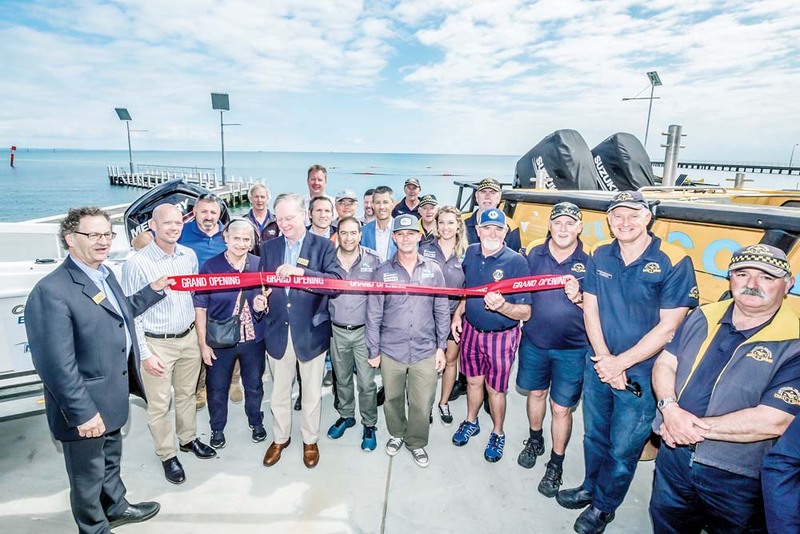 Also at the boat ramp opening were Marcus Higgins (Transport for Victoria), Steve Walker (CEO Boating Industry Association Victoria) and representatives from the marine industry, Rye Lions Club and Simpson Construction Company. Cr Hugh Fraser said “a lot of hard work” had enabled the ramp to be open for summer. “The extra boat ramp and renewal of the existing boat ramps was much needed and will make a positive difference to the boating community. It will ultimately make the area safer for its users and making it easier, quicker and safer to get all watercraft in and out of the water,” he said.